When the snow has melted and the frost has disappeared, it's a sign for Canadians to celebrate the warm weather that's on its way. And really, what better way to party than outside with friends and food? But for the roughly 34 per cent of Canadians who live in large metropolises like Toronto, Vancouver and Montreal, that can mean getting extra cozy with your neighbours in tight spaces, and trading in the spacious backyards of suburbia for petite patio spaces found in condos. But for internationally recognized chef Susur Lee, there's always a solution to tight squeezes. “I think sometimes people have plates and plates on the table and it’s just too big. Why not serve hot food in martini glasses? It’s easier to put in the dishwasher and it looks beautiful,” said Lee as he prepared two dishes at an outdoor entertaining event at Andrew Richard Designs this week. Combining ingredients like spotted prawns from British Columbia and bay scallops with red dragon fruit and mango, Chef Lee whipped up a ceviche served with a spicy mango salad in a martini glass for seafood fans. The dish reflects one of aspect of warmer seasons that gets the Canadian chef excited: fresh fruits and vegetables. “You’d be missing an opportunity if you didn’t use fruit,” said Lee as his team prepared vegetarian-friendly salads of orange, artichokes, charred onions, served with a lemongrass and carrot vinaigrette. 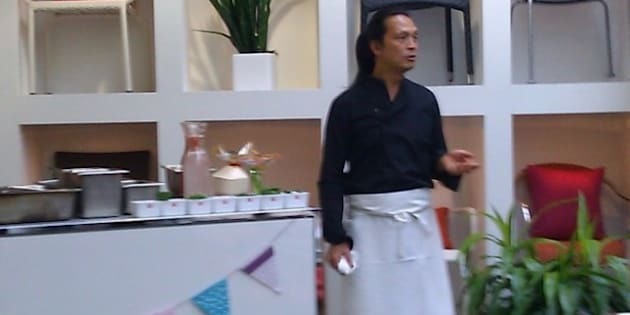 And while it’s likely most cooks won’t have things like lemongrass or carrot juice on hand, Lee says such ingredients can be found in places like health food stores or Asian supermarkets. For items that are exclusive to Lee’s repertoire, like ice syrup, good, old-fashioned Canadian maple syrup can work just as well. Lee also suggests using items like bamboo or banana leaves in lieu of plates, but the chef's final piece advice for party hosts recommends play as well as work: "Just don’t forget about vacationing," said a joking Lee.